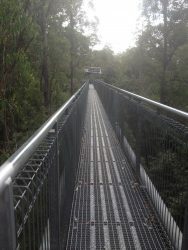 We went to the Southern Forests, where we did the Tahune Airwalk. This amazing structure has been built by Forestry Tasmania. This region is described as having ‘deep soils and high rainfall, producing the tallest flowering plant in the world; the Eucalyptus Regnuns’, known locally as The Swamp Gum. The Forestry Tasmania staff discovered the tallest hardwood in the world, a 99.6 metre tall swamp gum, named the Centurion. Fortunately, there was a bus to drive us to the beginning of the walk, as it was quite a hike, and once on this incredible walk, we were amongst the canopies of the trees, as well as looking at the centre of massive trunks, that seemed to reach the sky – so straight and powerful. 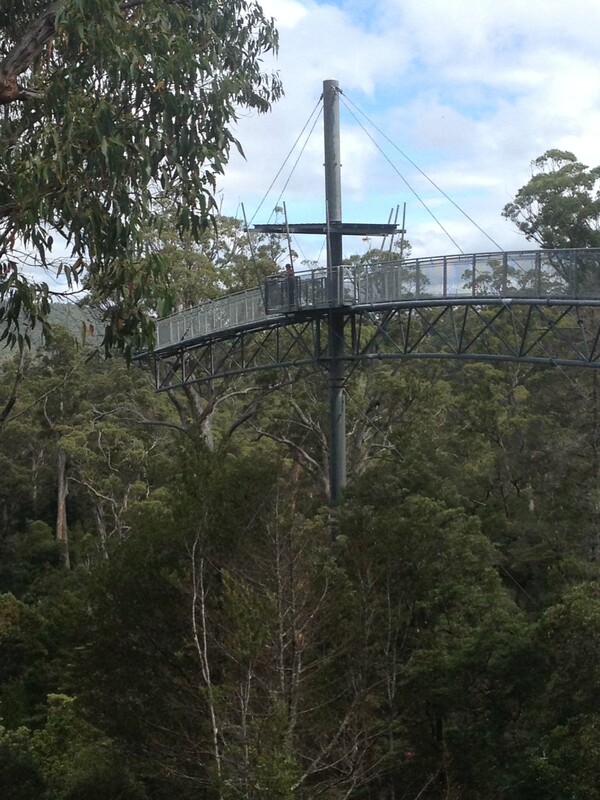 On the Airwalk we also could see the junction of the Picton and Huon rivers. It’s hard to calculate how high we were off the ground, but the walk gradually ascended and after approximately 600 metres, our walk was finished and our bus was waiting to take us back to the beginning, where we found a table, overlooking the wonderful Houn River, and enjoyed yet another picnic. 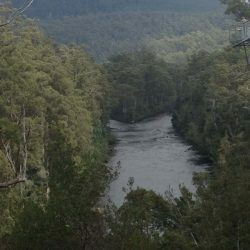 Russ then went on the Huon Pine walk, where he saw many small trees growing and one large one. This was 30 cms diameters, but 450 years old. This shows you how slowly they grow! For example, the Forestry had to cut down a 350 year old Stringy Bark and that tree was 17 metres circumference at the base. (The tree was rotten and dangerous). Today is our last day here and as there is a pizza oven in the camp kitchen, s owe decided to have pizza for lunch, which was delicious, although it took a half an hour to cook, but we were sitting in the kitchen, looking out on a lovely view of the mountains in the distance, ending up being over there for a couple of hours. Pack up this arvo and head to Southport tomorrow. A fun distraction after lunch found us wading through the river to retrieve our basin on the other side of the bank. A broom, with two extension handles did the trick. Fortunately its 28 degrees today, so we quickly dried out. I’ve forgot to mention, that Russ’ camera has been giving a Err 099 message, so photos are from our phones.